The above info came from Jason Helms, and was edited by yours truly (contact me). The image came from Amazon.com. 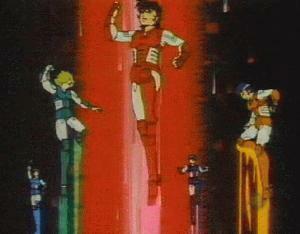 Yoroiden Samurai Troopers is the story about five teenage boys, given mystical armor to protect the world from the evil Arago. The story begun 1000 years ago, when Arago wanted to take over the ningenkai. He almost succeed when Kaosu managed to defeat him. However, although Arago's soul is banished to the Youjakai, his armor is left intact. The armor therefore becomes a link for Arago to come back to Ningenkai. Kaosu divided the armor into nine separate armor suits. Each armor will choose its bearer, and together they will fight Arago. At least that's the original intention (well, you know what happened next, don't you? ^^). Arago finds out Kaosu's plan, and thus attempts to find the armor himself. He manages to find four suits of armor with their four bearers, and persuaded them to follow (and serve) him. Those four are Shuten, Naaza, Anubisu, and Rajura. After they follow Arago, they become his MaSho (demon general). The rest of the armor, however, is still safe within Kaosu's protection. The bearer of these fives suits of armors are called Samurai Troopers. They are Rekka no Ryo, Korin no Seiji, Kongo no Shuu, Suiko no Shin, and Tenku no Touma. Each represents an element of nature and has a "kanji" that suits their personality. The above description came from a site that no longer exists and Tenku Yoroi no Miko: a YST page, and was edited by yours truly (contact me). There are 3 OVA series. 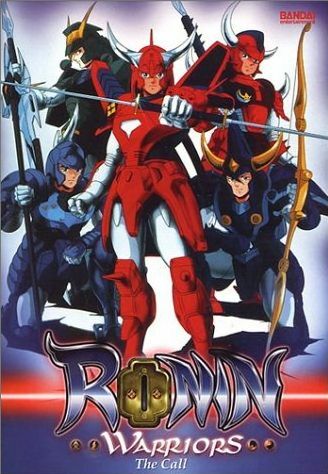 The first is a two-episode series called Legendary Armor Samurai Troopers Gaiden (Ronin Warriors Gaiden). The second is a five-episode series titled Legend of the Inferno Armor which introduces a tribal warrior from Africa who wears a mysterious Black Armor that looks eerily similar to Ryo's Inferno Armor. At the end of this series, the five armors, as well as both Inferno Armors, are completely destroyed. The Third OVA series is called Message , and it introduces a strange woman from the Edo period who was involved with a play that actually foretold in striking detail the events of the Samurai Troopers battle with Arago and the forces of the netherworld. The play ended when the government accused everyone involved with it of treason and executed them, leaving behind this woman, who vows revenge against the armors. The series is mostly composed of images from the main series and the "Legend of the Inferno Armor" OVA with characters talking about various things that usually have absolutely nothing to do with the scene you're watching. By the end of "Message" each one of the five has a brand new Armor, born from this woman's hatred and sorrow. The Armors are still called the same things as the old ones and bear the same symbols, they just look different. The above description came from Jason Helms, and was edited by yours truly (contact me).